a few months ago, i decided it was time to find out once and for all if a speck of me was jewish. i had convinced myself i was. how else to explain the profound holiness i find inside the nooks and crannies of all things jewish — the prayers, the writings, the blessing of the candles and the challah every friday night at our old maple table? most of all, the sanctification of time. of turning of the earth and all that glimmers under heaven’s dome? turns out, there’s not an iota of jewish DNA inside me. alas. but i decided to sit myself down — at that very maple table — string together a few sentences, and bravely knock on the window of America Magazine, the great national jesuit review. i happen to come from a long line of jesuit-schooled folk: my papa, my uncles, my brothers, my very own self. in the catholic world in which i grew up, all things jesuit were spoken of in hushed and reverential tones. their intellect, most of all. anyway, America Magazine decided to green light my little essay, to post it online and run it in the print pages, too. because the world we live in now demands that a writer “share” her work on the few social media sites that might draw one or two more eyes to the equation, some of you might have seen my posting on facebook (a rare return) or twitter. but not all of you — and certainly not my mama nor my beloved mother-in-law (whose birthday is this weekend!) — so for you, i’m posting here, direct from the pages of America Magazine. It was not long after our wedding under the cathedral of oaks in my mother’s garden, when I was but a young unpracticed bride, that I set our first Shabbat table, tentatively placing amid the dinner plates two Israeli candlesticks, a kiddush cup for wine and a braided loaf of challah (which I would learn to bake over time, at the side of a Holocaust survivor who became my Shabbas friend). A rite at once domestic and sacramental, Shabbat became for me a tucked-away cloister of anointed time. It is God whispering, I like to think. God cocking a finger, calling us home, each and every one of us. Come, be where it is still. Put time on pause. Savor this moment, this holy stretch of hours, savor each and every sense, savor and embrace the ones you love. And so, around the globe, as Friday’s sun slips from the sky, as our world dips into darkness, there is, house by house, table by table, the kindling of sacred illumination. shawl. The rhythms of the Hebrew prayer, even when the words escape me, tap the sacred within. I perk my ears to the still small voice that calls us, each and all. Sh’ma Yisrael, “Hear, O Israel,” begins the holiest of all the prayers. And my soul listens. on the soulful journey that is your own, have you been surprised by where you’ve found epiphanies and hallelujahs? p.s. happy blessed birthday, VPK, and ellabellabeautiful, too! the table is already set. the brisket — five pounds of it — now idles in the fridge. its exercise in surrender — from muscled slab to fork-tender succulence — began yesterday, when for nearly five hours it filled the kitchen, filled the whole house really, even the brick steps just beyond the kitchen door, with olfactory titillation — a mix of chili sauce and bay leaf, brown sugar, red wine, clove and peppercorn. no one’s coming for another 12 hours. but the preamble, the moment the binder of family recipes is pulled from the shelf, the moment i place the call to the butcher who always cracks a joke about my irish surname and my jewish cooking, that’s when i begin to be swept up in the magic of it all. i’ve had this friday night on the calendar for weeks now. it’s the shabbat when, after dinner, we will go to synagogue to say the mourning prayers, the prayers of yartzeit, marking the one year since my father-in-law, my boys’ beloved grandpa, the only one they ever knew, died. for this night, the word went out: please be home for dinner. and so, some time this morning, our old red wagon, now parked on a leafy college campus in iowa, will point east, pass cornfields and the occasional shimmering tower, and finally pull down our alley, bringing home the son who has now been without his father for a whole orbit of the globe around the sun. another boy will hop off his bike, park it in the garage, maybe think to wash his hands, once inside the bustling kitchen. and the third dinner guest will climb off the train, tuck his briefcase under his arm, and stride along acorn-pocked sidewalks till he gets to this old gray-shingled house. it’s the blessing of the friday night dinner, a blessing like no other i have ever deep-breathed. as the week lurches to a close, as deadlines are met, and hustle and bustle hit pause, i circle in on final preparations. candles stand erect on the table. lids topple off the coterie of pots and pans. i blanket the challah — the loaf of braided egg bread that’s a staple of shabbat — with the cloth my firstborn penned with brightly-colored markers long ago in kindergarten sunday school. wine will be poured. and one by one, they’ll trickle in, the boys i love. they’ll have put their busy weeks, their worries and distractions, behind them. i’ll strike the match, put flame to wick, and unfurl the first of the three blessings. blessings for the sanctuary of time we’ve constructed friday after friday, just before sundown, according to ancient text and modern-day awe. for all time is holy, but on friday nights when the table’s set, the candles are burning, and the faces you love are the ones you look up to see, that’s when the cloak of holiness drapes most certainly around your shoulders. tonight, we’ll raise a glass of deep red wine, and my husband will lead us in the prayer we call “grandpa’s prayer,” the shehecheyanu, the blessing reserved for the most extraordinary times, the most sacred times. the times when you reach deep down to the bottom of your soul, and pull up grace and blessing. when every pore of your being shimmers with the knowing of how richly, finely, you’ve been blessed, anointed by purest holiness. and because i stumbled on my own jewish prayer of blessing, of remembering, i too will recite words that stir me to full attention, words that make me bristle with deepest knowing just how sweet the hour is, every blessed hour, and the turning of each season. and the knowing, too, that the ones we love are ever woven into the whole of who we are. In the rising of the sun and in its going down, we remember them. In the opening buds and in the rebirth of spring, we remember them. In the rustling of leaves and in the beauty of autumn, we remember them. When we have joys that we yearn to share, we remember them. So long as we live, they too shall live, for they are now a part of us, as we remember them. may the memory of my beloved father-in-law, arthur zavel kamin, ever be a blessing. and may your friday night be drenched in all that is holy, is deep, is broken loose from the shackles of haste and deadline. do you have a weekly pause for holiness? what’s your preamble for sinking into sacred time? it is friday, a friday. it will soon be shabbat. it is time for baking with henry. henry and i bake challah together. henry is my teacher. henry lives downtown. in a tall black building. i live in a leafy little town 12 miles north. in a stone-and-shingle, two-story house. we bake over the phone. henry is jewish. i am catholic. henry is a grandfather; he talks about growing up in germany, before the nazis erupted. every friday night, he tells me, stewed chicken or brisket main-staged the meal; the challah, his mother’s opening act. 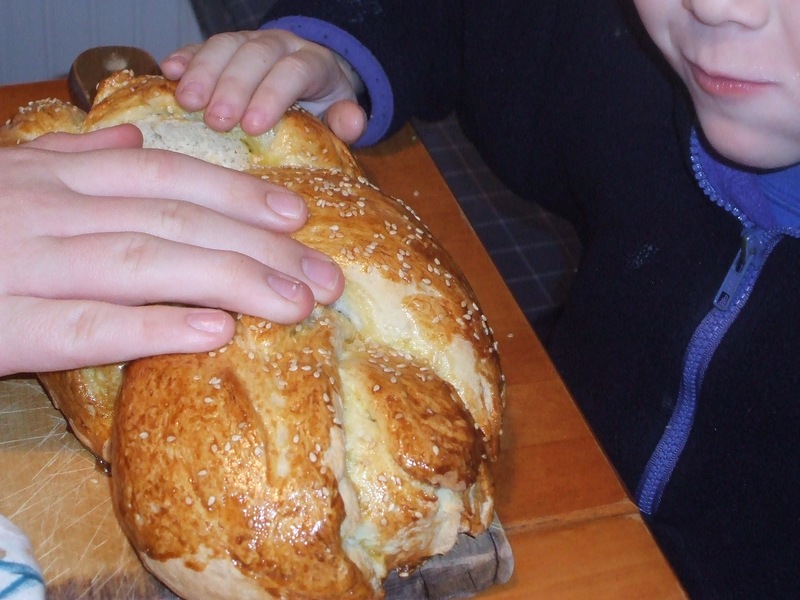 challah, the braided egg bread that is the sustenance of shabbat, the sacred canyon of time stretching from sundown friday to sundown on saturday, marking, each week, the seventh-day rest at the end of God’s original creation. i am a mother, a wife, married to a fine jewish man. we have two boys, growing up jewish and catholic. together, we lift up shabbat, wrap up our harried work week with the pause and the majesty of blessing bread, blessing time, at our table. i have, over the years, made shabbat mine. i sink into the rhythms of friday, sink into the rhythms of unfolding shabbat. i slow cook on fridays. i pick and choose from the book shelf, finding a passage worth reading, a thought worth shabbat. i put out the candles. i bring out the wine. i reach for the yarmulkes, or little skull caps. and, after years of wishing i could, i now bake for shabbat. henry is sifting through my lumps, leavening my learning. henry is teaching me challah. he came to me in an email, with story attached. last year, typing away on a 10-year anniversary book for our synagogue, i culled recipes for a few trademark foods. the rabbi’s brisket. his wife’s gefilte fish. henry’s challah. it was then that i made my first call to henry. add water, just one little drib at a time, he advised. place dough in warm spot to rise. about 1 hour, he had written. two hours later, accidentally out longer than planned, i came home to dough that had let out its air. i put in a second call to henry. that night, we broke bread but it was more like we were breaking a flat-shelled turtle. this was challah without the rise. this was challah gone flat. henry called the next morning. he was with me now, and wanted the word on what in the end had come out of the oven. and so it went, week after week. i progressed. sort of a reptilian progression. one week a turtle, the next week an alligator. it would be weeks before the soft twisted mounds looked anything like the challah in the bakery windows. and then my kitchen was demolished. so all baking stopped. but it is a new year, and a new kitchen. so henry and i begin baking again. the flour is measured and dumped. the yeast, quick-rising, mixed in. i know how to knead. i know that one hour’s rise, not two, and not three, is essential. best of all, i know henry’s number, even in florida. stay tuned for the reptilian report. _ To taste: Poppy seed, Sesame seed, Kosher salt, etc. dough forms. Get dough as smooth as possible in mixer. add a little more oil for elasticity. Knead for 5 to 10 minutes. 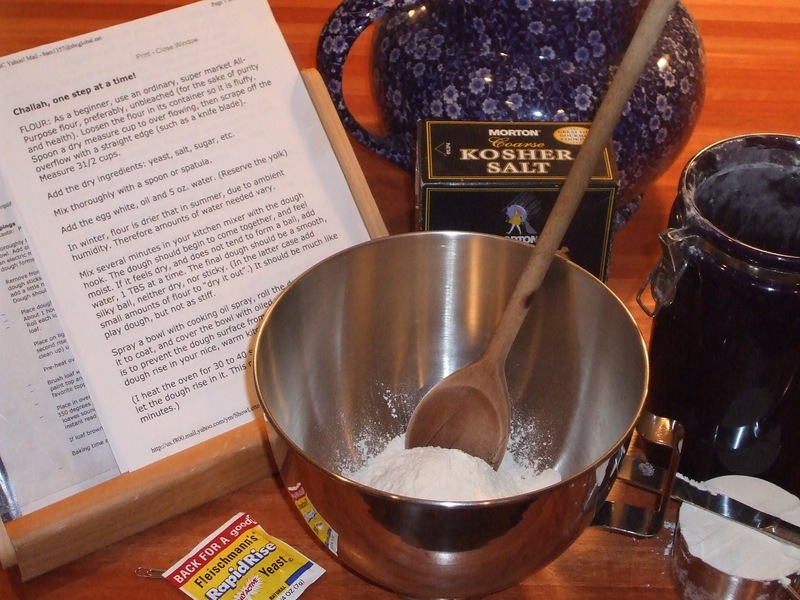 Dough should be moist and elastic. _ Place dough in oiled, covered bowl, in a warm spot, to rise. _ About 1 hour. Gently deflate dough and divide into 3 lots. Roll each lot into a rope, about 10 inches log, and braid to form the finished loaf. second rise, (or use a parchment paper lined sheet, which makes for less clean up) until doubled, about 45 minutes. _ favorite topping: poppy seed, sesame seed, kosher salt etc. loaves sound hollow when tapped on the bottom. It is best, though, to use an instant read thermometer and bake to 190 degrees internal. If loaf brown too quickly during baking, tent with aluminum foil. Baking time about 30 minutes. Cool on rack. after i struggled with this version, henry sent a tutorial, titled, “challah, one step at a time.” i’ll send–or post later–if you, too, need henry over your shoulder.